Pitchers want their cleats to last a long time. from wear and tear since 1991. NEW for 2019, ProtecToe® Style 21 Catcher’s Toes – fiber reinforced injury prevention and protection. See Gallery photo and Order Form for details. You can fill out Form on-line or copy and fill out by hand. Place the Order Form in the box. Send the shoe(s) requiring pitching toe to Hurler Athletic, 2755 SW 49th Street, Corvallis, OR 97333. You will get a Hurler email upon receipt. Your shoes will be processed within two days. Return shipping via FedEx Ground included in our price. FedEx emails you tracking info. Hurler Athletic’s patented urethane epoxy is permanently bonded to your shoe while remaining lightweight, tough and flexible. Because it’s applied custom to your shoe, we can fit any wear pattern. Our ProtecToe® coverage is perfect for all types of sports and all types of wear — from pitchers to catchers, from football kickers to linemen, even track and field. All ProtecToe® applications are fully guaranteed. Contact us for more details, or order now. Since 1991, Hurler’s ProtecToe® pitching toe has become the preferred standard for professional and college baseball and softball teams across the country because of our superior product and unmatched customer service. 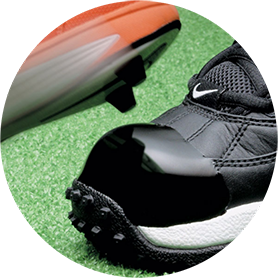 The standard pitching toe coverage is shown above. If your wear pattern is different, just mark the shoe with tape or a felt tip pen to indicate where the ProtecToe® pitching toe will do you the most good. Our thickness is based on the average wear of a major league pitcher. The goal is to provide adequate wear protection without too much weight or bulk. Thicker toes may be requested, but only with the understanding that there will be more weight and less flexibility in the toe area of the shoe. Our standard colors are black, blue, red, and white. Nonstandard colors include grey, forest green, navy blue, purple and maroon. We will attempt to match any color presented (except flourescents, neons, and metallics) with the understanding that it will not be the exact standard PMS color but will be hand-mixed to the closest shade. Developed in conjunction with two top athletic shoe manufacturers, our Injury Protection product filled a void in available preventative protection for injured feet. Our standard pitching toe is reinforced with a fiber core, producing a hard shell cover for injured areas of the foot. especially in the toe box area. Initially designed to protect existing injuries such as turf toe, bunions, or sprained/broken digits, the ProtecToe® Injury Protection product ¡s now popular as a preventative measure against suffering the injury in the first place. A number of major college programs outfit their offensive and defensive linemen prior to the season to reduce and eliminate toe end foot injuries. • Only send the shoe that needs the ProtecToe®. • Ship it in a box that is as small as practical for the number of shoes you are sending. especially when you’re shipping by expedited air freight. Oversized boxes can double your shipping costs, regardless of weight. • Instead of shipping a worn shoe as an example for ProtecToe® coverage, consider taking a photo and including that in the box. • Use a single box — shipping the shoe box in shipping box will cost you money. • Consider USPS Priority Mail for expedited shipment. Their 2-3 day delivery is up to half the cost of UPS Blue or FedEx 2 Day unless you have access to deep discounts through your work or school. The typical ProtecToe® coverage is illustrated above. If your critical wear or is different, include Special Instructions on the Order Form or mark the area on the shoe. If you provide your email address on the Order Form, we will send you confirmation of both receipt and return shipment of your order from Hurler Athletic Company, including Fed Ex tracking numbers, where available. No more than three days after receipt at Hurler Athletic, your shoe(s) will be return shipped via Fed Ex. The price includes regular Fed Ex return freight. If expedited shipping is required (Next Day or 2nd Day Air), include Special Instructions on the Order Form. Expedited freight will be billed at cost and is available with Visa/MasterCard or School Purchase Order payments only. pitching toe has been recognized for its toughness and flexibility since 1991. 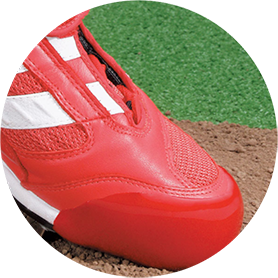 Using a patented urethane epoxy, Hurler Athletic applies a custom ProtecToe® pitching toe to the area of the shoe where you need it. No messy kits or ill-fitting glue-on patches. D1 NCAA College Baseball World Series teams Mississippi State Bulldogs, LSU Tigers, Texas Longhorns and World Series Champion Oregon State Beavers are Hurler ProtecToe® teams. Four of the eight 2017 NCAA D1 College Softball World Series teams are Hurler ProtecToe® universities. Oklahoma Sooners, Oregon Ducks, Georgia Bulldogs, and Washington Huskies. Congratulations to the champion Florida State Seminoles! Hurler Athletic introduces Custom Colors to all MLB teams. Beyond black, blue, red and white is a rainbow of new colors and shades that we can closely match. At Hurler Athletic Company, we welcome your comments and value your feedback. You can contact us electronically, via fax or phone, or through the mail. Our goal is to respond to all comments and to answer all questions within forty-eight hours of receipt. To email, please use the contact form below.